Diam circlet = 60, diam cord = 2, capsule L = 53, W = 32, th = 28.2, w strips = 23.5, diam seed pellets = 4 mm [RTS 6/12/2004]. 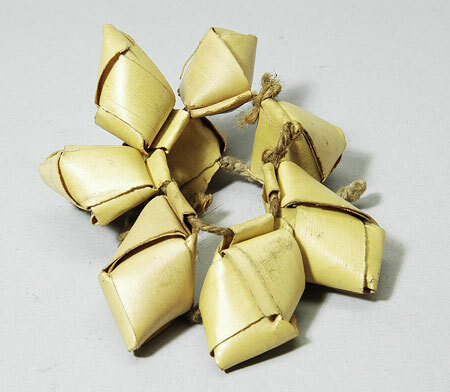 Dance rattle, consisting of a series of 8 capsules formed from broad strips of yellow palm leaf (Pantone 7403C), folded into a lozenge shape with several flattened faces, enclosing a moderately sized cavity that has been filled with small pellet-like seeds, measuring 4 mm in diameter, that produce a dry rattling noise when the capsules are moved. These capsules are fastened to one another using 2 lengths of twisted 3-ply brown plant fibre cord (Pantone 465C), that passes through their top part, where one strip has been bent into a loop for this purpose then its ends tucked back into the body to secure it. 5 capsules are tied together in this way to form a circle that was probably worn around the arm, wrist, knee or ankle. This cord has been knotted in 3 places along its length. There is an additional length of cord that has also been used to fasten together the bottom parts of 4 of these capsules to the top parts of 3 additional capsules, creating a second circle that follows the line of the first then breaks away from it. This second loop is knotted in one place. In practice, this means the rattle could be worn with 7 capsules running around its circumference, and the additional 8th capsule hanging more loosely, or with 5 capsules around the limb and 3 hanging loose. Perhaps this enhances the sound. The rattle is complete, although the cord is quite frayed in some areas. It has a weight of 18 grams, and has a diameter across the circlet of 60 mm. A typical capsule is 53 mm long, 32 mm wide and 28.2 mm thick, made of strips that are 23.5 mm wide, while the cord has a diameter of 2 mm. This was presumably designed to be worn around either the arm or leg. Similar folding of palm strips is seen on some Shilluk items (cf R. Boccasino, 1964, "Contributo allo studio dell’ ergologia delle popolazioni Nilotiche e Nilo-camitche. Parte quarta. Il vestito, il tatuaggio, le deformazioni del corpo, gli ornamenti e la circoncisione", Annali Lateranensi XXVIII, figs 34-5). Accession Book Entry [IX, p. 16] 1931 [insert, in pencil] 66 [end insert] E. EVANS-PRITCHARD , Esq. Dec. Specimens collected by himself in the EASTERN SUDAN, viz. [pencil insert, p. 18] 32 [end insert] - Dance-rattle, 8 capsules of palm leaf containing loose pellets, NUER. Old Pitt Rivers Museum label - Dance-rattle. NUER tribe, E. SUDAN. Pres. by E. Evans-Pritchard, 1931.66.32 [front], 1931.66.32 [back; rectangular metal-edged tag, stored in RDF; RTS 6/12/2004]. Sparks, Rachael. "Nuer rattle" Southern Sudan Project (in development). 03 Jan. 2006. Pitt Rivers Museum. <http://southernsudan.prm.ox.ac.uk/details/1931.66.32/>.